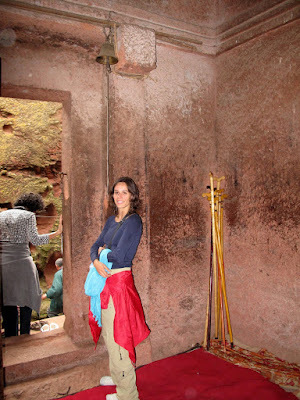 Ethiopia from the 10th to the mid 13th centuries. 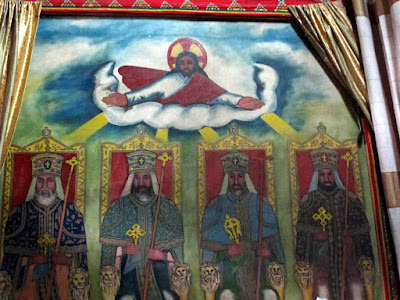 King Lalibella was the strongest and most famous of the kings of the Zagwa Dynasty who ruled the kingdom of Ethiopia between the first quarter of the thirteenth and the last quarter of the fourteenth centuries from their formidable native mountain fortresses of Waas and Lasta long after Axum had stopped being the political center of Ethiopia. King Lalibella Semitic baptismal name was Gabra Masqual “Slave of the Cross”. According to local legend, Lalibella was born the brother of the incumbent king. As a young boy, he was covered by a swarm of bees, which his mother took as a sign that he would one day be king. The king was not too pleased at this prophecy, and tried to poison his younger brother, but instead of killing him, he cast him into a deep sleep that endured for three days. 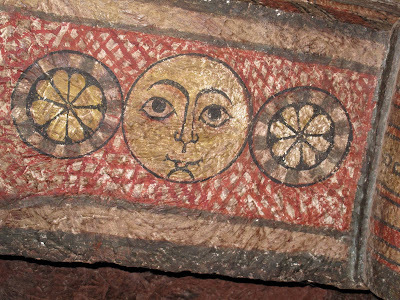 While sleeping, Lalibella was transported to heaven by an angel that showed him a city of rock-hewn churches, which he ordered Lalibella to replicate. When the older brother saw that Lalibella was not dead, he said he had a vision in which Christ told him to abdicate in favor of his younger brother, Lalibella. 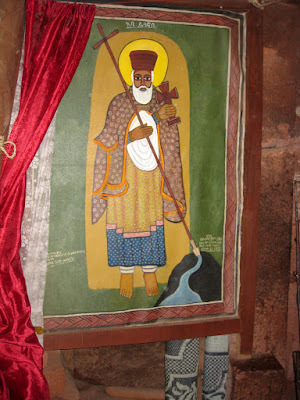 THE STICK TO THE RIGHT IS SAID TO BE THE ACTUAL LEANING STICK OF KING LALIBELLA. 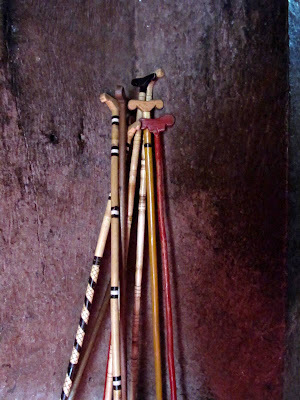 THE STICK IS USED FOR SUPPORT DURING PRAYER. 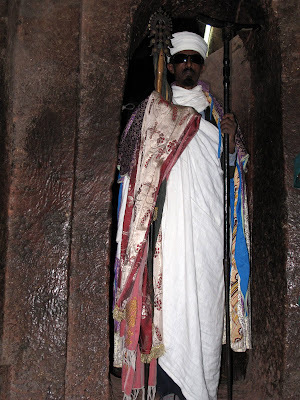 As soon as Lalibella was crowned, he set about gathering the greatest craftmen and artisans to carve the churches. Legend has it that one of the churches was built in a day with the help of angels. 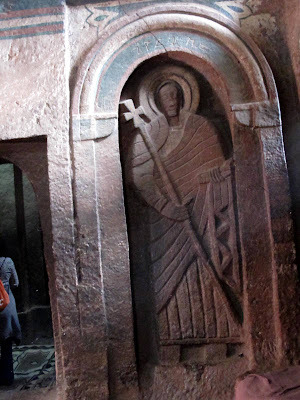 Today archaeologists estimate that up to 40,000 people would have been required to carve the churches. King Lalibella was on the throne between the years 1205 to 1225. 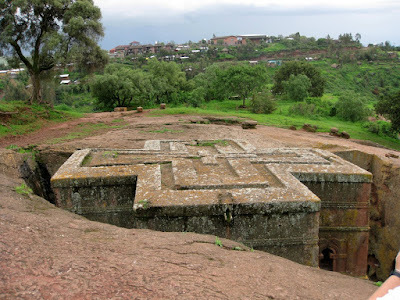 His fame was so great that the old power center of the dynasty was later renamed after him, “Lalibala”, where we now have eleven of the most beautiful rock-hewn churches in Ethiopia that are attributed to his reign. 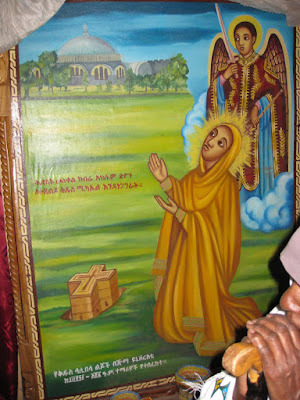 King Lalibella was the champion of the Ethiopian Orthodox Church and is one of the most highly respected and canonized monarchs of Ethiopia.